Exams » Medical » NEET Exam Pattern 2019 – Syllabus, Marking Scheme, Question Paper, Etc. NEET Exam Pattern 2019 – Syllabus, Marking Scheme, Question Paper, Etc. NEET Exam Pattern 2019: NEET 2019 is a pen and paper-based exam for medical aspirants seeking admission in different medical and dental colleges across the country. According to the NEET Exam Pattern, the exam is held for a duration of 3 hours (180 minutes) during which students will have to answer 180 objective type (multiple choice) questions from Physics, Chemistry and Biology. More than 10 lakh students appear for NEET every year for nearly 1 lakh seats. That says a lot about the kind of competition that medical aspirants have to go through as they start their NEET preparation. 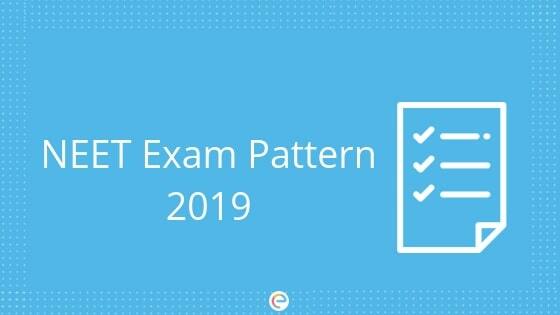 In this post, we are providing you with complete, detailed information regarding NEET Exam Pattern 2019. All NEET 2019 candidates are advised to carefully acquaint themselves with the types of questions asked, marking scheme, etc. of the NEET Exam Pattern 2019. Candidates can opt for Question Paper in either of the following languages such as English, Hindi, Telugu, Tamil, Assamese, Bengali, Gujarati, Marathi, Oriya or Kannada. The option of medium of question paper will be exercised during the form filling process. Candidates who opted for English will be given the English test booklet only. Candidates who opted for Hindi will be provided with the Bilingual Test Booklet, i.e., in Hindi and in English. Candidates who opted for vernacular languages will be provided with the Bilingual Test Booklet, i.e., in the selected language and in English. Embibe’s NEET study material can be of great help to revise the whole syllabus of NEET 2019. You can also solve unlimited NEET practice questions for every subject. At this point, you must also take NEET mock tests and work on chapters and concepts you couldn’t answer or those that you got wrong. You must master the important chapters for NEET 2019 as well. We hope this information regarding NEET Exam Pattern will help you. For any clarification regarding NEET Exam Pattern or the exam in general, feel free to drop a comment below and we will get back to you.